I have a Fender US Highway One series Stratocaster, which is a half decent guitar, but looks just like a million other Strats. I had been planning to replace the pick guard with a black mother of pearl guard but my experiments in electrolytic etching made me think I'd like to try something a bit more unique. 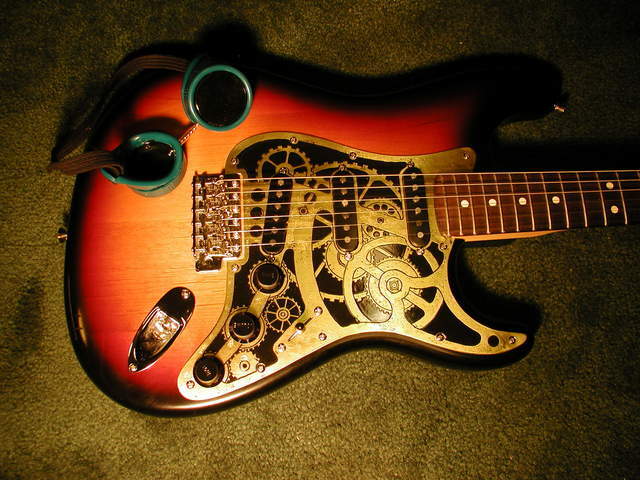 Thus the Steampunk Strat was born. 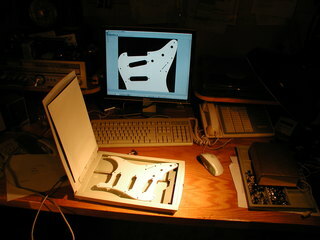 I started by scanning the pick guard and printing out a bunch of copies that I could sketch on until I got the image that I wanted. 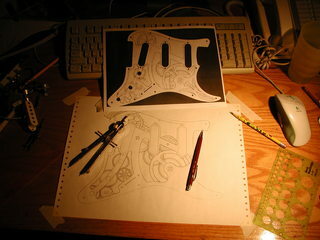 Next I carefully traced an outline of the pick guard and begun to draw my image. 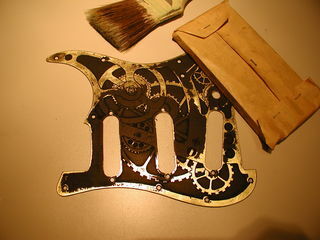 The concept was to make the pick guard look like a brass clock escapement with gears, cogs and a flywheel. 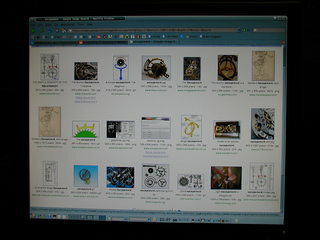 Google images was instrumental in finding images of clock escapements I could cadge features from. Once I had a good drawing I scanned it back into the computer and filled in the black area with the Gimp (a Linux image editor like Paint Shop Pro). This gave me a mock-up to test on the guitar. 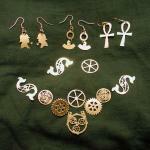 Next step was to cut the brass and to iron a laser printed reverse image on it. 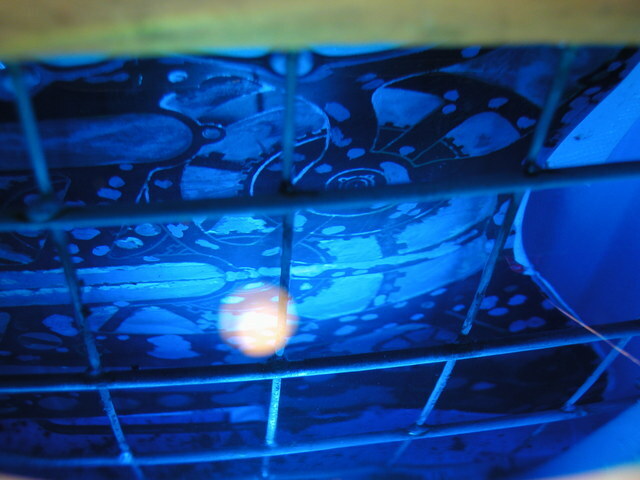 See my article on Electrolytic Etching for the details of that process. There were some gaps and flaws in the toner mask so I touched it up with paint. 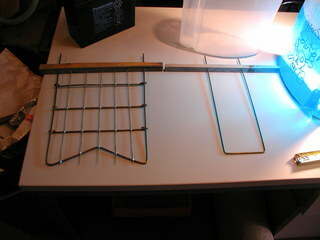 Into the copper sulfate bath, I made a nice cathode grid and a new plate holder out of brazing rod for this project. 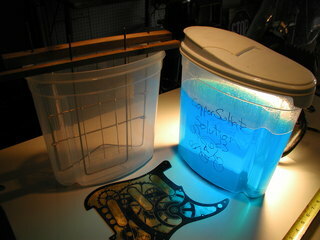 Mysterious energies etch away the copper and zinc components of the brass. I love that blue! 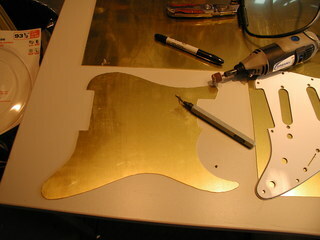 The etched pick guard was cleaned up with steel wool, drilled and the pickup holes cut out. 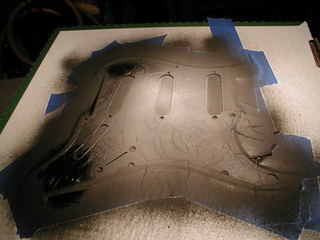 Then painted with 2 coats of Krylon Ultra Flat Black. After the paint dried overnight I sanded away the high spots, polished it a little with some more steel wool and gave it a couple of coats of lacquer. 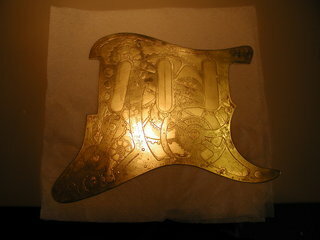 I painted the pickup covers and knobs with Krylon Plastic Fusion paint and re-assembled the pick guard to the guitar. If you are interesting in making your own, the original artwork can be found here. 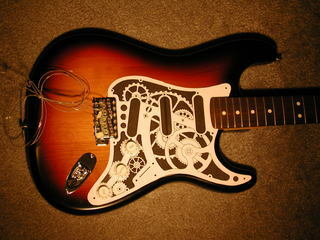 The finished Clockwork Steampunk Stratocaster ! Could I use your final pic as part of a band logo? If so, can I get a high resolution file? Since that guitar was sold to a friend for one of his band projects, I don’t think it would be fair of me to allow that, also I don’t have any hi-res images from that era, sorry! Hey, Jake, very cool pick guard! Looks like a business venture just waiting to happen!